This great new model is designed and manufactured to a quality standard that highlights the technically advanced production techniques of Dorema. What makes the the Garda 240 Deluxe perfect for the Australian storms and weather systems is that it is fitted with solid window blinds able to be rolled down and secured for extra security, privacy and added protection. A perfect awning for sited caravans, you will also notice there is no need for guy ropes… no more tripping over in the dark after not seeing a rope! The Garda 240 Deluxe is produced in the latest top quality Ten Cate all Season acrylic material ensuring that you can feel totally confident your new awning will stand the test of time. As standard this awning comes supplied with a 25mm galvanised steel frame with easy grip clips shown below , covered zips in matching material are added for extra protection. The optional annex extensions come in 2 sizes and 2 roof types are designed to fit on either the left or right-hand side of the awning, the front of the awning is also fitted with beading for the optional Palma awning canopy extending your outdoor living space to double that of the awning itself. 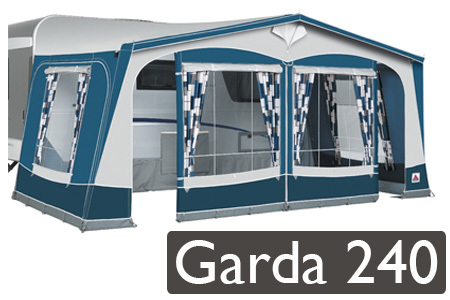 Please note: Prices quoted for the Garda 240 Deluxe above are for the smallest size awning available and without any optional extras, quoted price includes delivery to your door within Australia.